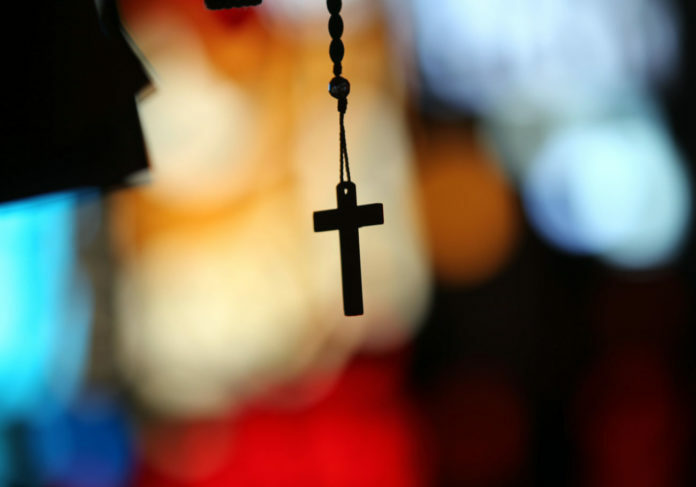 The Catholic Diocese of Brownsville on Thursday released its list of child sexual abuse by 13 priests and a deacon, who were assigned to 42 parishes in the Rio Grande Valley. The church identified the priests and deacon “credibly accused” of sexually assaulting children, most recently in 2010. The list, however, does not include four priests’ current locations or at which parishes the abuse took place. The sole deacon on the list, Ronaldo Mitchell Chavez, 45, who most recently worked at San Cristobal Magallanes in Mission, remains incarcerated at a state prison in Huntsville for sexually abusing an altar boy in 2010. Chavez was also a state-certified teacher and principal. “Back in September, we were aware that there is a credibility problem, in terms of after the Pennsylvania report, so the bishops … wanted to do a couple of different things. One is each diocese to do an exhaustive study of its own files by a group that is independent,” said Bishop Daniel Flores of the Catholic Diocese of Brownsville. Texas Catholic bishops made the decision to release names of clergy members “credibly accused” of sexually assaulting minors in October 2018, two months after a Pennsylvania grand jury uncovered rampant sexual abuse by priests who molested more than 1,000 children since the 1940s. “Painful as it is to see names … it was necessary,” Flores said, adding that a group of Catholics trained to deal with sensitive information reviewed personnel files of all clergy members stored within the diocese in Brownsville. The group, known by the church as laypersons, compiled information about clergy members “credibly accused” of sexual abuse against children since 1965 — the year the region’s Catholic diocese was created. The Catholic Church has been scrutinized in recent years for relocating abusive priests from their assigned churches to other locations, instead of cooperating with law enforcement and removing the accused from the clergy altogether. Assigned to the Basilica in San Juan, Basil Onyia, 52, fled to Nigeria in 2001 amid a criminal investigation into accusations he sexually abused a teenage girl, according to Bishop Accountability, an organization tracking sexual abuse within the church. Onyia was accused of showing the girl a pornographic video and fondling her. Humberto Acosta, 69, was assigned to five churches in Brownsville, Edinburg, Harlingen, Mercedes and Pharr. He has since left the diocese for Venezuela. Ivan M. Rovira, 73, last officiated a Mass in Matamoros, Mexico, where he continued working as a priest as late as 2005, according to the Dallas Morning News. Rovira, prior to leaving for Mexico, was assigned to churches in Hidalgo and Cameron counties. Details surrounding the child sexual abuse allegations involving Acosta and Rovira were not revealed by the diocese, making it unclear at which parishes the abuse took place or the age of the victims. Though records kept by Bishop Accountability and newspaper archives detail where four of the eight living priests went after the sexual assault allegations arose, it’s unclear where four might currently reside. Lee DaCosta, 81, retired from the ministry in 2012; Armando Escobedo, 82, and Marti G. Zuber, 68, were removed from the priesthood, and the church is in the process of doing the same to Terrence Fowler, 57. But their whereabouts are unknown. Six of the priests on the list assigned to churches in the Valley have died: George B. Dyer, 78; Frank Gomez, 85; James Jeffrey, 83; Benedicto Ortiz, 80; Salvador Rangel, 55; and Salomon “David” Sandoval, 64. “One victim is too many, and we want to have all the protections possible, to make sure this sort of thing never happens,” Bishop Flores said. “The only way to ensure that the bishops here in Texas are truly sincere about rebuilding their sacred trust is to allow for independent, properly vetted and trained experts in law enforcement to review all files and allegations related to clergy sexual abuse,” a SNAP statement read. SNAP, a nonprofit organization, wants Texas Attorney General Ken Paxton to conduct an independent investigation into allegations of sexual abuse within the Catholic Church. Bishop Flores said the there is no active priest, deacon or bishop within the Brownsville diocese, encompassing all of the Valley, credibly accused of sexually assaulting children. The following is the list of 13 priests and the deacon released by the Catholic Diocese of Brownsville and parishes they were assigned. >> Humberto Acosta, 69, was ordained in May 1974 and left the diocese in 1994. He was assigned to St. Mary, Mother of the Church in Brownsville; St. Joseph Church in Edinburg; St. Anthony Church in Harlingen; Our Lady of Mercy Church in Mercedes; and St. Margaret Mary Church in Pharr. >> Lee DaCosta, 81, was ordained in April 1973 and “retired” in 2012. He was assigned to Sacred Heart Church in Edinburg; Sacred Heart Church in Escobares; St. Theresa Mission Church in Faysville; St. Anthony Church in Harlingen; Holy Family Church in La Grulla; St. Joseph the Worker Church and Sacred Heart Church in McAllen; St. Joseph the Worker Mission Church in San Carlos; St. Anne Mission Church in San Manuel; Immaculate Conception Church in Rio Grande City; Our Lady Queen of the Universe Church in San Benito; St. Joan of Arc Church, San Martin Porres Church and St. Pius X Church in Weslaco. >> George B. Dyer, 78, died in 2013 and was assigned to St. Luke Church in Brownsville and Campus Ministry in Brownsville and Edinburg. >> Armando Escobedo, 82, was removed from the ministry in 2002. He was assigned to Christ the King Church and St. Luke Church in Brownsville; Our Lady of Guadalupe Church in Lyford; Our Lady of Mercy Church in Mercedes; Our Lady of St. John of the Fields Church in Mission; St. Anthony Church in Raymondville; and Francis Xavier Cabrini Church in Laredo. >> Terrence Fowler, 57, was ordained in June 1988 and was removed from the ministry. He was assigned to St. Joseph Church in Alamo; Christ the King Church and St. Luke Church in Brownsville; Immaculate Heart of Mary Church in Harlingen; and Our Lady Queen of the Universe Church, San Benito. >> Frank Gomez died in May 2014 at the age of 85. He was assigned to St. Joseph Church in Alamo; Our Lady of Guadalupe Church in Brownsville; St. Francis Xavier Church in La Feria; Sacred Heart Church in Mercedes; St. Theresa Church in San Benito; St. Mary Church in Santa Rosa; San Martin de Porres Church in Weslaco; and St. Francis Xavier Cabrini Church in Laredo. >> James Jeffrey died in 2017 at the age of 83. He was assigned to the Christ the King Church in Brownsville and St. Francis Xavier Church in La Feria. >> Basil Onyia, 52, was ordained in 1996 and removed from the ministry in 2001. He was assigned to Immaculate Heart of Mary Church in Harlingen and Basilica of Our Lady of San Juan del Valle-National Shrine in San Juan. >> Benedicto Ortiz died at the age of 80 in 2011. He was assigned to Good Shepherd Church and Our Lady of Guadalupe Church in Brownsville; St. Anthony Church in Harlingen; Our Lady of Sorrows Church in McAllen; St. Anne, Mother of Mary Church in Pharr; Knapp Memorial Methodist Hospital in Weslaco; and HCA Rio Grande Regional Hospital in McAllen. >> Salvador Rangel died in 2000 at the age of 55. He was assigned to St. Joseph Church in Donna and Our Lady of Assumption Church and Valley Baptist Medical Center in Harlingen. >> Ivan M. Rovira, 73, was ordained in May 1971 and the church removed some of his duties, but he continues to hold the right to perform sacraments, like Baptism and marriages. He was assigned to Holy Family Church, St. Mary, Mother of the Church, Our Lady of Guadalupe Church in Brownsville; St. Joseph Church in Edinburg; Our Lady of Sorrows Church in McAllen; St. Joseph & St. Peter Seminary in Mission; and St. Pius X Church in Weslaco. >> Salomon “David” Sandoval was ordained in 1979 and died at an unknown date. He was assigned to Our Lady of Guadalupe Church in Brownsville; St. Joseph Church in Edinburg; Our Lady of the Holy Rosary Church in Mission; and San Martin de Porres Church in Weslaco. >> Marti G. Zuber, 68, was ordained in 1976 and removed from the ministry in 1993. He was assigned to St. Joseph Church and Campus Ministry in Edinburg; St. Anthony Church in Harlingen; St. Joseph Church the Worker in McAllen; Holy Spirit Church in McAllen; Immaculate Conception Church in McCook; Holy Spirit Church in Progreso; St. Anthony Church in Raymondville; and San Martin de Porres Church in Weslaco. >> Ronaldo Mitchell Chavez, 45, was ordained as a deacon in 2010 and removed from the ministry in 2012. He was assigned to San Cristobal Magallanes & Companions Church in Mission.